I entered into the classroom at the University of Utah's Bountiful extension last night like every other Tuesday night. That's where I have my State and Local government class. I really enjoy that class - my professor is very pleasant and she makes the subjects interesting. Last night was different. My two younger sisters, Tawni and Brittany, had a voice concert at a library. I enjoy watching them and usually make time to see them, but I couldn't miss class. There was something else afoot, however. Something far away. The Jazz started their eastern road trip last night against the most hyped team in the league, the Miami Heat. (I think it would be inaccurate to say the most feared team in the league.) It started at 5:30 p.m. MST, so as I waltzed into class the game was already underway. A quick check of the score before started brought no surprise to my eyes: the Jazz were trailing by double digits. ESPN's GameCast showed the Jazz getting handled early in the game, and I assumed the beating would continue. I turned my computer off and participated in a discussion on Health Policy. My class is three hours long, so naturally my attention span wanes before the end. "Time to check out my Jazz," I eventually thought to myself. My boys in blue were still down by double digits. I casually checked the score over the next few minutes. Suddenly I found myself completely enveloped in the GameCast as the Heat's lead slowly diminished to single digits. When the game was tied with mere minutes left I had forgotten where I was. An actual video feed would have been nice, but I kinda liked the intensity of waiting for the next play to be broadcast. Jazz up by two points. Minutes left. I wanted to believe they could pull it out, but after years of watching the Jazz give up leads, I just couldn't. My doubts became reality when the Heat easily regained the lead and took the game over. Cue the magic. on my screen I almost gasped loudly. Millsap? Really? Never have I seen him make a 3 in a game. At the Leapin' Leaners charity dinner every year, yes, but shooting around the ESA in dress clothes is different. That isn't a real game. In Miami. Against LeBron, Wade, and Bosh. With people in his grill. The best part was that he wasn't getting lucky. The ball graced only net on all three shots. He topped it off with a last second put back to force the game into overtime, totaling 11 points in 30 seconds. THE JAZZ WERE DOWN BY 8 WITH 30 SECONDS LEFT! Amazing. Jazz clinched the win in overtime with help from Anrdre's trey and two deafening free throws by veteran Francisco Elson. A huge win by any standard, but it was that much sweeter against the Heat. 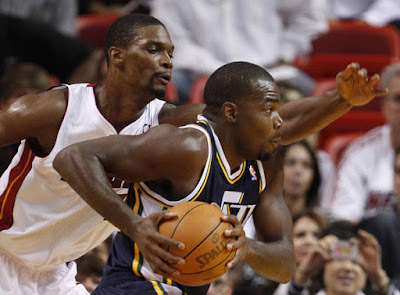 To all those sudden-Millsap fans out there, I want to say "shame on you." I have been a Millsap proponent since I first saw him play in Utah. All through the Boozer years I pleaded with Jerry (through mind bullets) to play Paul over Carlos. A consistent player, Paul has always impressed me with his game. I saw a scrambler in the post develop an outside shot that was smooth as lotion on a baby's bottom. Playing "backup" to Boozer, Millsap amazed me with his ability to play against the bigger man. (He's listed as 6'8'', but he's got to be shorter...6'6" maybe.) Always a love of mine, I am glad to see that Utah is finally appreciating Paul Millsap: the man who dethroned the king. After the game I watched the video of Tawni and Britt singing at their recital. They did excellent, and they are so gorgeous. I love your "smooth as a baby's bottom" analogy, that really put it in terms I could relate with! I guess since you have two gorgeous little sisters, it's now time to post about your other sister. I owe you a post as well...just you wait! Brady... I LOVE your post. I just wish I had read it before last night's loss put a damper on things. It doesn't take anything away from the Heat victory, though!!! AMAZING. I have been a loyal Paul Millsap fan since I first saw him play in the Rocky Mountain review. In fact, I told him that at Leapin' Leaners. His "thank you" wasn't quite as enthusiastic as I was hoping (not even a hug!). :-)! Sure love your passion for the Jazz. You would have made a great usher.